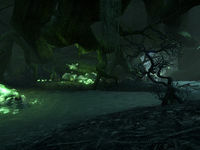 Bad Man's Hallows is a pocket realm of Oblivion centered around a giant tree. The tree is in fact a minor Daedra Lord who channels dark energy through the tree's roots. As the tree grew, so would the realm itself. In 2E 582, a circle of mages testing the boundaries of conjuration, including Curator Nicholas, Eveline Vette, and Finvir, held a summoning of a Dremora Lord out of curiosity and search for divine knowledge. Though it was a very risky proposition and unauthorized by the Mages Guild, the conjurers managed to summon the Dremora Lord using a number of gems. However, the Lord killed most of the conjurers and corrupted the rest of the circle to mindlessly do its bidding. It then impersonated an old Breton harvest god named Sheor, the Bad Man, and made a deal with Nicholas. "Bad Man" would have the mindless followers trick gullible visitors to the tree's glen into burning food as part of the "Harvest Festival" to drain their souls and feed the tree, expanding the realm. The Soulless One would soon arrive and be convinced to partake in the Harvest Festival. Though seemingly consumed by the tree, their undying nature had them survive in the roots beneath where they met with a captured Eveline Vette. 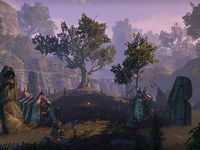 The roots beneath were home to wildlife like hoarvors, shalks, skeevers, and giant snakes, with the insane sacrifices and undead skeletons of conjurers wandering the tunnels as well. With the help of Vette, they used shalk glands and tendrils to burn the roots, and collected the summoning gems sought by Finvir. Vette then sent the Soulless One back to the glen, where the "Season of Harvest" had taken place. Wounded by the damaged roots, Bad Man set the glen on fire, and the Soulless One burnt the remaining tendrils on the offering altar. Bad Man arrived at the burning tree to deal with the hero directly, but was defeated. Using the gems, Finvir assured the hero that Bad Man would be vanquished from the realm and could never return to Nirn. This page was last modified on 29 October 2018, at 00:19.